Materials Science Artificial Intelligence (AI) Project Supports Data Service Initiative. The Data Science and Learning Division (DSL) at Argonne National Laboratory tackles advanced scientific problems where data analysis and artificial intelligence can provide critical insights and accelerate discovery. A primary thrust of the division is to build cross-cutting capability at Argonne to tackle advanced scientific problems where data analysis and artificial intelligence (AI) are key problem solving strategies. Argonne projects produce data of great scientific value, from explorations into renewable energy and global climate change, to cutting-edge research to bolster the fight against cancer. The more easily this data can be analyzed by various analysis services, the more useful it is for the researchers who rely on it to drive discovery. So DSL scientists have undertaken a project to develop a lab service for interactive, scalable, reproducible data science, leveraging machine learning methods to reduce simulation costs and increase data quality and value for researchers. As a testbed for developing this service, project leaders collaborated with the Argonne Leadership Computing Facility (ALCF), Materials Data Facility (MDF) team in Argonne’s Physical Sciences and Engineering Division, and with the Globus team, in a project leveraging machine learning to improve model development. Materials scientists are key users of leadership class computing; their studies are critical to improving economic security and competitiveness, national security and human welfare. Finding and understanding new materials is complex, expensive, and time consuming, often taking over 20 years for research to make its way from experiment to industrial application. To accelerate this process, researchers and facilities are motivated to work together to develop data platforms and tools that are accessible to a broad set of scientific researchers. The Materials Data Facility (MDF) is one project that supports this research collaboration goal by offering a scalable repository where materials scientists can publish, preserve, and share research data; MDF provides a focal point for the materials community, enabling publication and discovery of materials data of all sizes. One key MDF project focused on understanding and modeling “stopping power,” defined as a “drag” force experienced by high speed protons, electrons, or positrons in a material. Stopping power has applications in areas like nuclear reactor safety, solar cell surface adsorption, and proton therapy cancer treatment. It is also critical to understanding material radiation damage. Time-dependent density functional theory (TD-DFT) offers a great way to compute stopping power: it is highly parallelizable, parameter-free, and can accurately reproduce experimentally-measured stopping powers. However, TF-DFT computations and expensive, and scientists increasingly need to easily access stopping power for many different types of materials in all possible directions, and even ascertain the effects of defects on the stopping power. 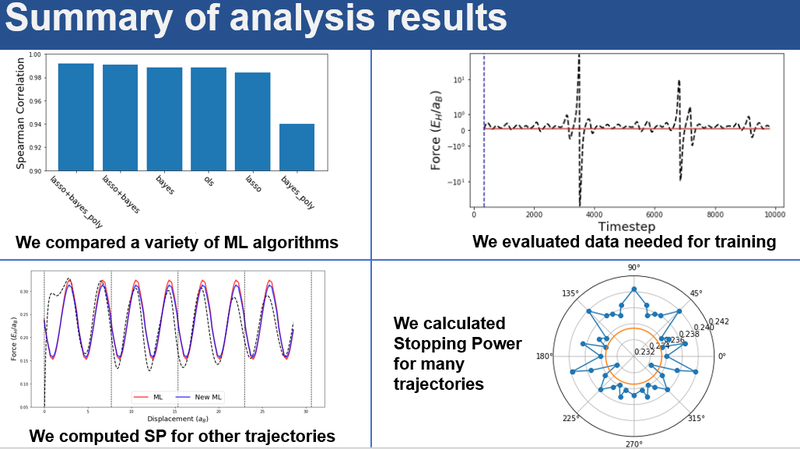 Thus, DSL researchers are using machine learning to extend TD-DFT’s capabilities. Scientists selected a representation for their data in this project by determining what ‘atomic structure’ actually means in terms of inputs to the model (e.g., what determines force on a projectile, and how does one quantify the effect of this force?). They then trained a machine learning algorithm, selecting an algorithm based on the key criterion of highest prediction accuracy as well as feasibility to train with >104 entries, speed of evaluation, and ability to produce a differentiable model. To identify the best model, the scientists followed a simple and common procedure: first identifying suitable algorithms (linear models and neural networks in this case), then testing using cross-validation and validating using data outside the original training set. 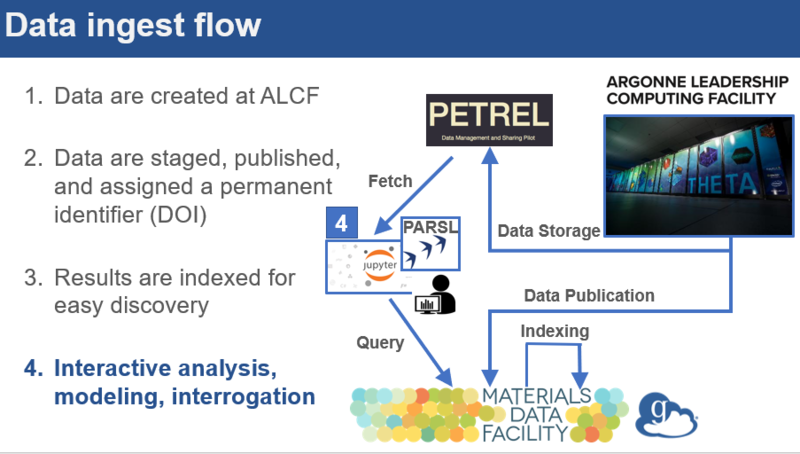 To facilitate this pipeline using the Globus Platform, scientists first built a search index using Globus Search and MDF capabilities, and populated it with simulation details (e.g., the particle energy) and pointers to the underlying data files on the Petrel Globus endpoint at ALCF. The researchers then used Globus Search functionality embedded in a custom data portal to assemble the data and stage the data from Petrel to the ALCF Cooley resource for computing using Globus Transfer. Finally, a series of Jupyter notebooks running on ALCF’s Jupyterhub instance were used for building the models and for interactive exploration of the data. During this phase, computation-intensive jobs were sent as parallel tasks to Cooley using the Parsl parallel Python scripting library. Throughout the pipeline, Globus Auth and other Globus platform APIs were used to simplify data access, staging, discovery, synthesis, and movement. Thanks to this project, Argonne’s DSL has created a surrogate model interactively using ALCF data service capabilities leveraging MDF and the Globus platform, with the original results extended to model stopping power direction dependence in Aluminum. To review a slide presentation of this project, click here.